I’ve been wanting to write this post (and several others, actually) for quite a while now, but the month of February was plagued with some of the worst Internet access speeds I’ve experienced here in Tanzania for a long time. Things seem to be back in order now and I’m happy to return to blogging. In January our friend Trevor came to visit our shamba while he was in Nairobi on business. As we messaged back and forth making our plans, he asked if there was anything he could bring for me from Nairobi. Long ago, before I had even moved to Tanzania, I heard a rumor that it was possible to find chocolate chips in Nairobi. I had used up the last of my stash so I asked him to bring me some if he could find them. Trevor had brought me a one-kilogram (that’s 2.2 pounds) bar of solid milk chocolate (which, he learned, does raise suspicion at the airport when your bag goes through the x-ray). I was excited to get back to Arusha and see what I could make. I’d been hanging on to a Pinterest recipe for quite a while that combined some of my favorite foods: chocolate, peanut butter and pretzels. Peanut butter is no problem to find here in Tanzania. Like chocolate chips, however, pretzels are also nearly impossible to find. I’m guessing that’s German on the package. I was grateful for the open window on the bag and the cute illustration of a pretzel man to confirm for me that I was, in fact, buying pretzels. So with my newly found pretzels and one-kilo bar of chocolate, I set out to make No Bake Sweet & Salty Peanut Butter Pretzel Bars. I loaded the recipe onto my Kindle and gathered the rest of my supplies. The recipe called for two cups of chocolate chips so now was the time to figure out how to simulate chocolate chips from a solid block of chocolate. Enter: my Pampered Chef food chopper. When I lived in Baltimore my kitchen was heavily stocked with Pampered Chef products that I just loved. But the sad reality was that I couldn’t fit an entire set of cookware and several other kitchen implements in my suitcase when we moved to Tanzania. So I narrowed it down to just the few small things I really thought I would get a lot of use out of here: the food chopper, ultimate slice and grate, and a couple of knives. I gave the rest of my Pampered Chef collection away to friends. I am happy to occasionally see photos of those things surface on Facebook when my friends are posting about their own cooking pursuits. It’s like catching up with a long-lost friend. So with my Pampered Chef knife I cut the large block of chocolate into smaller blocks that would fit inside the food chopper and started chopping away. It went pretty smoothly and didn’t take too long. I was glad I had frozen the chocolate bar first; it made it easier to chop into chunks. With the chocolate and peanut butter topping nicely melted, I added it to the base and sprinkled the rest of the remaining German pretzels on top. The recipe said to refrigerate for three hours before cutting. I think I lasted about 90 minutes before giving in. The layer of orange smeared on his face beneath the chocolate and peanut butter layer is mango, which is what the Good Mother part of me fed him for a snack. The Bad Mother part of me then let him eat two—okay, maybe it was three—of the peanut butter pretzel bars. So let it never be said that the lack of chocolate chips will deter me from making yummy chocolate treats. I used the remaining chocolate to try a new chocolate chip cookie recipe to serve when I hosted my Bible study group at our house, and ate a fair amount of it directly from the package. Another Baltimore friend, Carole, recently visited and brought along not just chocolate chips but also peanut butter chips and dried cranberries so I’m all set for a while in my baking endeavors! Hi Brenda! I’m Sharon Powell’s mom, and I’ve so been there! No chocolate chips was a real issue for me and I tried all kinds of things to make do. 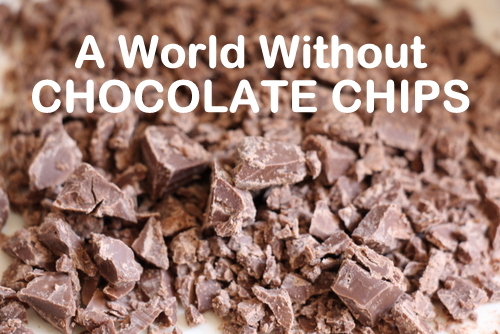 Milk chocolate is (of course) not the same, but anything in a pinch! And I found that American chocolate chips keep their shape better in cookies than other bar chocolate, which just tended to melt. Made me wonder if there is some wax in real chocolate chips. So — here’s to you! Keep it up! Who knows what you may discover/invent/enjoy.